I'd like to do the repair described above, but I'm a little auto body challenged. How do you get the plastic shroud off to expose the wiper assembly? I see some triangular cover plates in the corner, which seem to be held on with rubber plugs but I'm afraid I'll tear the plugs when I try to pry them out. Remove windshield wiper bolt caps. These are black plastic caps that cover the nut that holds the wiper arm to the tower that protrudes from plastic shroud. Remove wiper arm nuts that hold the wiper to the tower. Remove gasket / engine compartment seal. This seal is located between the engine compartment and gutter that the wiper arm and motor sit in. This seal sits just on top of the shroud and keeps it tight to the body with small plastic T shaped clips. It runs the length of the top of the engine compartment if you are standing in front of the car. Gently lift up one edge and you'll see a black plastic clip. Squeeze it with a needle nose pliers, place the pliers between the frame and gasket as you are gently lifting. Continue from one side of the engine compartment to the other until it is removed. 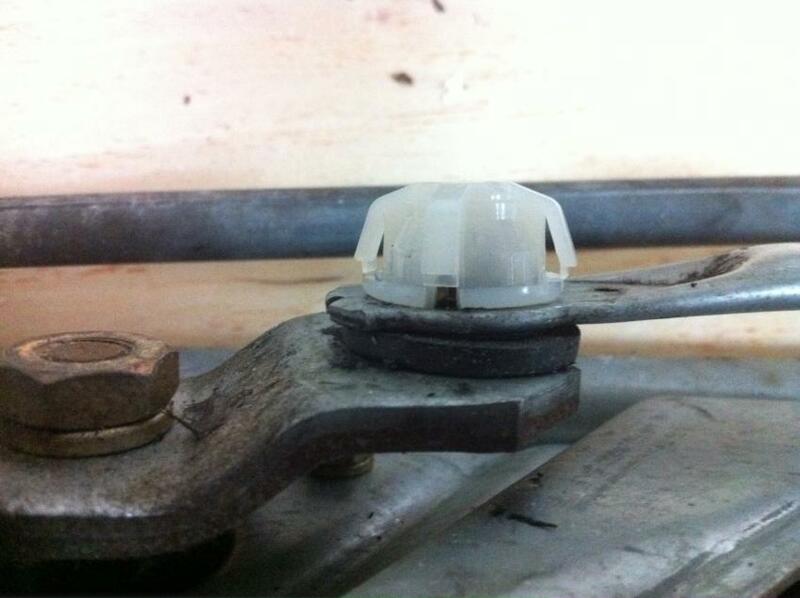 If one T shaped clip comes out of the gasket, no worries, you can easily force it back in. Remove the shroud. There are larger white clips, spaced about 8 inches apart, that are just under the windshield. Place both hands under the shroud, find the first clips on one side of the car and gently pull up, the clip will release and the shroud will pop up. Repeat the process as you work your way to the other side of the car. There is also a small rubber seal between the shroud and windshield, pay attention to how it connects to the shroud for installation. This is only there to prevent rattles. The wiper arm assembly and motor are now exposed. Three 10mm bolts hold it in, two located to the extreme driver side of the gutter and one in the center of the gutter. The center bolt needs to be removed from inside the engine compartment. Disconnect the electrical connection using two regular head screw drivers. Press the light grey clip down with one screw driver and use the other to separate the black and light grey connectors by placing it between the two and slowly twisting. A little twisting and tugging of the connector should also help get the two separated. You can now remove the assembly and inspect it for wear. Install is reverse of removal. Just be sure you plug the electrical connector back into the assembly and motor when you reinstall. Do you mind posting a photo of the installed grommet for everyone to see? Also, by installing the grommet, you will not be able to reinstall the white plastic lock. Am I correct? Thanks! BB, this the picture from Google Pictures of the PCV Valve 42058. P.S. Just be aware that the rubber will perish over time with heat and use, but for a buck and a couple of minutes of your time it is a quick fix if it does indeed work. First, I really appreciate those who posted advice in this thread. I found the thread by googling a description of the problem I was experiencing. The advice posted here put me on the right track to solve the problem for less than $10. The driver's side wiper on my 2000 Legacy had too much play similar to what has been described in this thread. It became increasingly worse and eventually, at speeds above 45mph, the wiper would travel over the edge of the windshield before being whipped back with a bang. It was dangerous and inconvenient. I found this discussion, identified that I had a worn out link joint as others described, and used a PCV Valve to fix the problem. The wiper worked great for about six weeks but then failed suddenly and completely. I was almost home from a long winter trip when my wipers stopped moving altogether. I removed the wiper assembly and discovered that the action of the wiper had almost completely severed the valve and the arm had jumped off the socket. 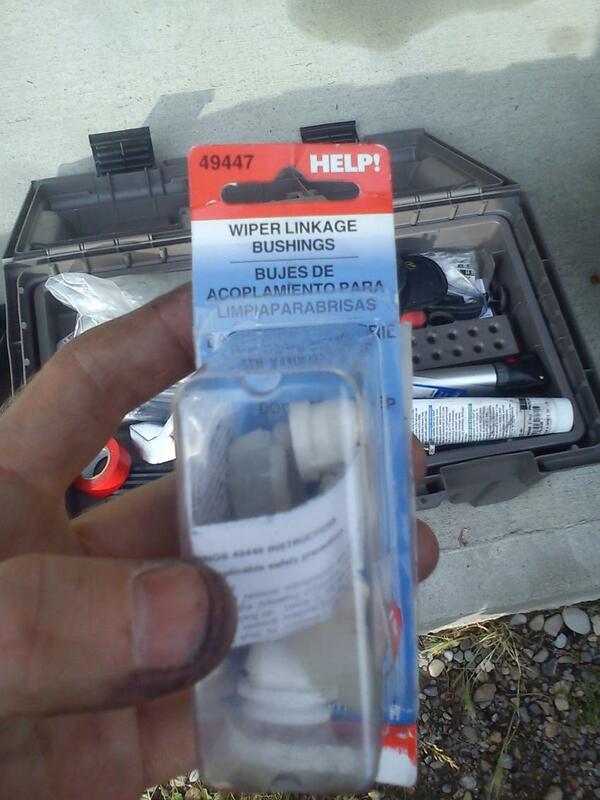 I went to an auto parts store and found a "Wiper Linkage Bushing Assortment". Brand is "Dorman Help! ", model number is 49447, and cost was ~$4. One of the sizes of bushings fit quite well. However, there was a gap that needed to be eliminated. 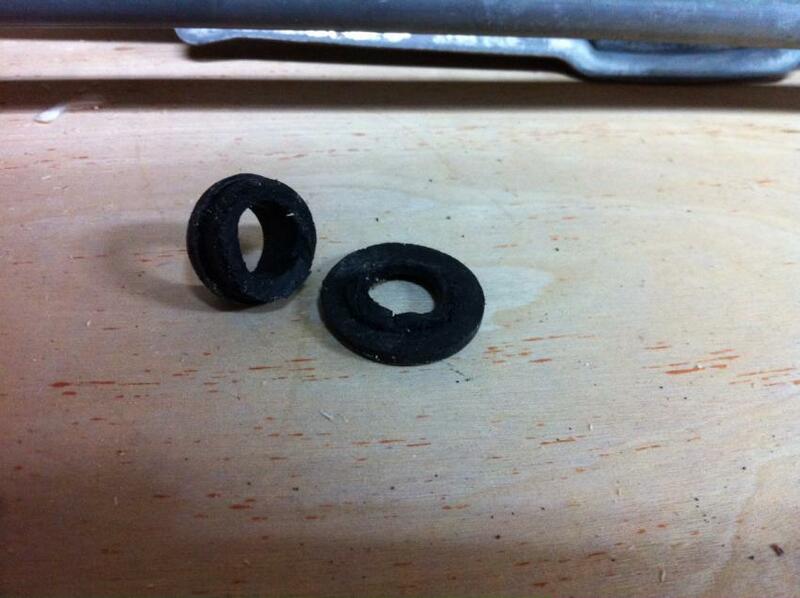 I cut the little bit of rubber that was keeping the almost severed valve together and used the bottom part as a washer. It filled the gap and the new bushing now creates a tight connection. Time will tell if this new solution lasts. I caution those who experience the linkage problem that a valve-only solution might not last. 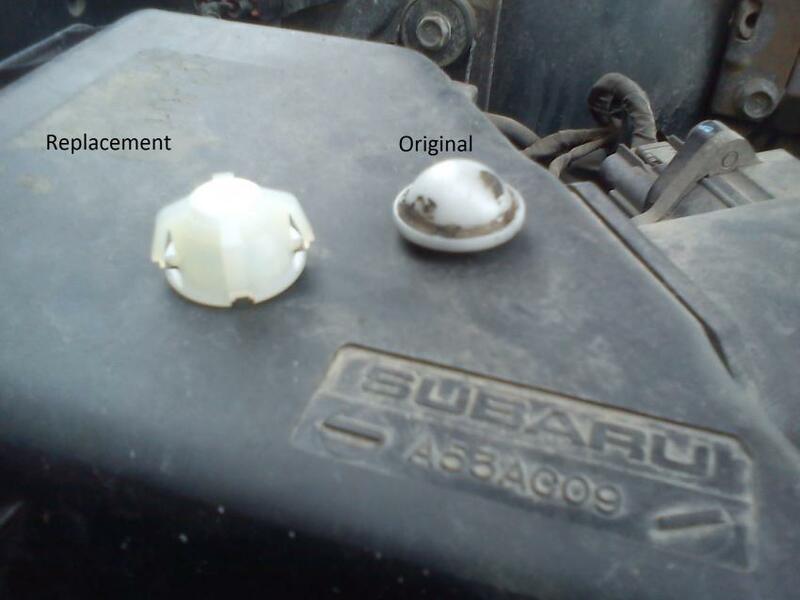 The replacement bushing is fairly low cost and should be more durable. I am attaching several photos to show the various components I mentioned. Thanks for all the posts that come before this one, they were very helpful and made it possible for me to repair my wiper play. I used the norman (part#49447) replacement bushings trimmed them a bit and reinstalled everything with a new washer to take up some slack and it works great. I made a youtube video to show the process hope it helps. I have the same problem with my 99 Forester S. I am about to head home from work and do this exact fix - excellent post/photography with the fix - I am impressed. I have one problem though, it is raining so if I disassemble my wipers to find what size washer I need, I will have to re-assemble to drive to get the bits-n-pieces. Perhaps you could post what size, gauge, depth of washer is needed? They aren't as stupid as we thought! first off, thank you all for your posts, in particular those with photos/videos, they have been a great help. I have experience the same wiper problem with my 99 Forester and attempted two of the solutions described above, namely that described by SuperRu with the washer and that described by ScoobyDrew with the Dorman part #49447. Great ideas, I especially love the simplicity of the washer. Unfortunately, in cases such as mine, where the shoulder on the original bushing is completely worn, even a washer won't help. Keeping the actuator arm on the what is remaining of this shoulder requires almost enough force to pop the bushing off the ball-joint - not an ideal solution. After the second time the bushing joint popped off, I went out and bought the Doorman #49447 replacement bushings. First I tried Scooby Dreq's method, nice video by the way, great help. I trimmed off the flange from the bottom of the replacement bushing, slid it through the hole in the actuator arm and popped it back onto the ball-joint. Nice, it seemed to work great, the play was gone from the wipers and all was well - for a day or so. Unfortunately, it was still possible for the actuator arm to slide off the bushing (toward the motor) - leaving us back at square one. What to do? Well, i could put a washer between the bushing and the ball-joint mount, a-la SuperRu, but that would leave me at risk of the bushing popping off mid-wipe, so I took another look at the bushings. The are supposed to be universal replacements, right? So perhaps they have been tried on a few cars. I know Foresters aren't the most common auto on the road but, surely, someone has been in this situation before. 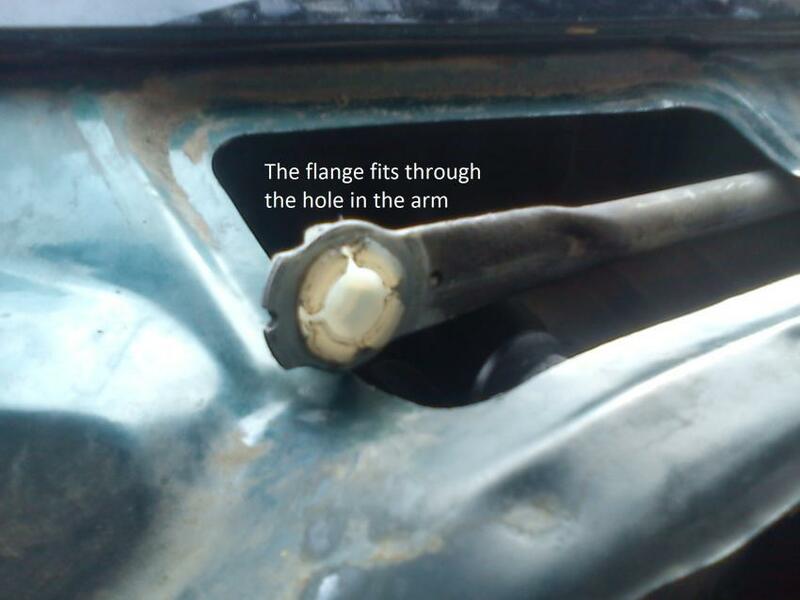 Moreover, why the flange? 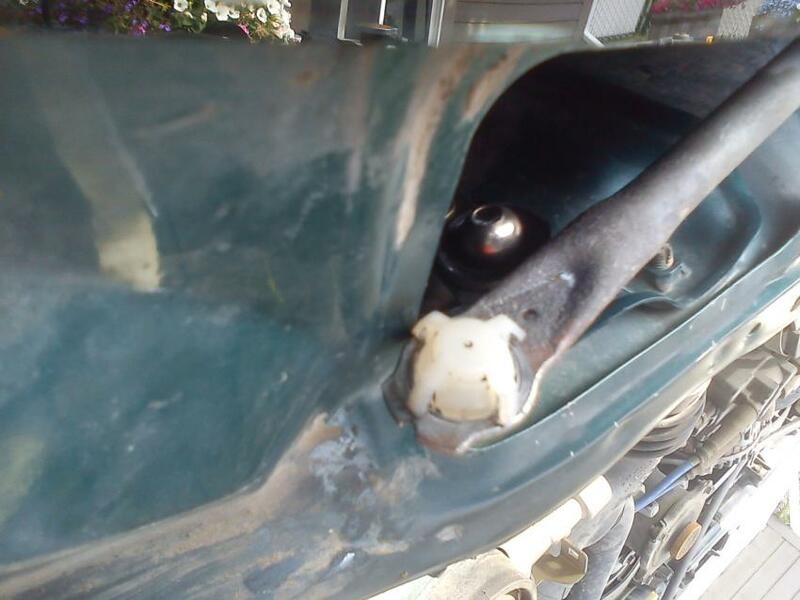 Well, it appears that those Dorman guys are not as green as they are cabbage-looknig.. the bushing should be pressed through the hole in the actuator arm and just clicked onto the ball joint. Ok, well this sounds obvious, so why has nobody done it? Well, because it's REALLY hard to do! It is a tight fight and it takes a lot of BFI. Take a new bushing and try to fit it into the hole and you'll understand, almost impossible. So take a knife and trim the flange back a tiny little bit and still no-go. Now take a cup of boiling water and drop the bushing in for s minute or two, it will soften, now, it should fit in relatively easily (when I say 'relatively' I mean, it will only drive you slightly insane, and you shouldn't need a sledge hammer). A couple if tips, if you have the time and are enthusiastic, take out the entire wiper assembly and fit the bushing on a bench. If you spend time wrestling with it with the full linkage installed, you will likely twist the arm and damage one of the other bushings (and then you will realise why there are three replacement bushings in the packet!). Secondly, install it dry and then apply grease afterwards. Really, if you grease it you will have no grip on it and will likely loose it somewhere in the depths of the wiper assembly channel. 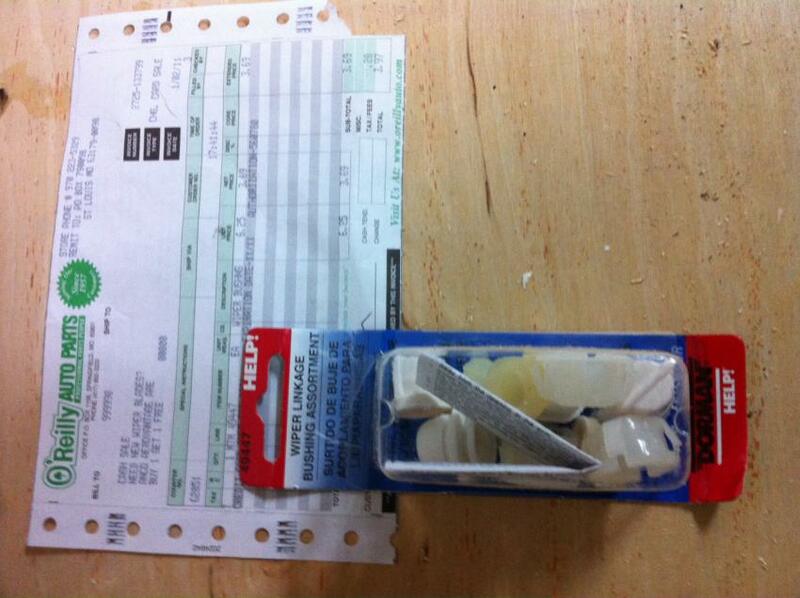 Anyhow, all-in it's a half hour job, with parts you can get in almost any auto-parts store for under $10. The hardest task is removing the cap on the service hole over the wiper motor, everything else is simple. 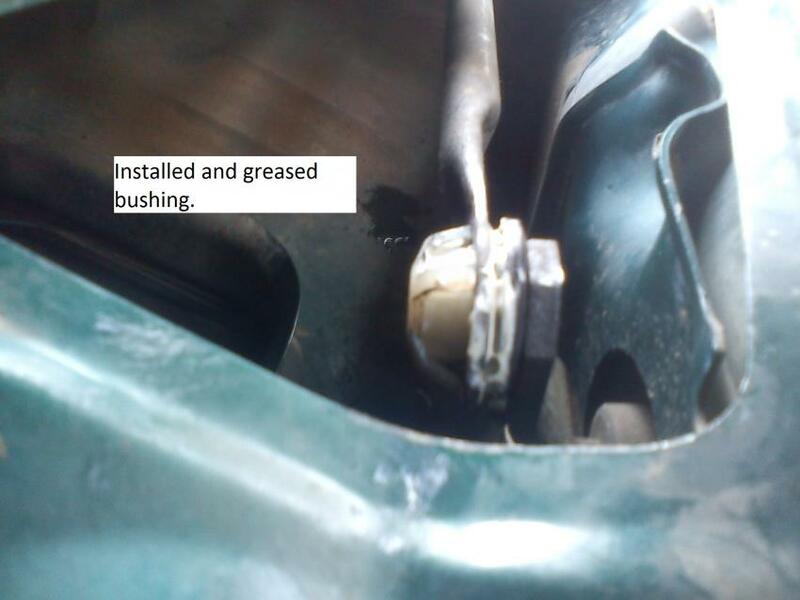 3: Trim/Heat the new bushing, make the swap and grease. 4: Put everything back and hope it doesn't rain. Attached are some photos of the job. I hope this helps. This thread saved a lot of headache on my 04. I had the classic 3 inches of slop and my the wipers going all over the place when in wet conditions and where parking really high. I pulled the whole assembly (it was only three bolts) to do the swap with the Doorman #49447 bushings. I trimmed them a little, and then relied on a vise grip to get them into the linkage arm hole. I would say the hardest part was getting the wiper arms realigned properly. First try, they where too high, second try, the driver's side arm hit the other arm, and the third try everything's perfect and they park over the defroster, not that I need defrosting in Florida. I will advise everyone that Advance is showing the bushing kit as discontinued and none of the local stores or warehouse had them in stock, and my local Autozones didn't have many in stock. I didn't check Pep Boys. I noticed the flop in mine too, and it aggravated the poop out of me. Read this thread, bought the plastic bushings (the one on the motor was actually missing), trimmed one a little bit and placed it in there, and put it back together, tested it, and was good to go. Took about 20 minutes or so. Thanks for the DIY instructions. It's been a while since you posted this solution: I'd like to ask how it's holding up. Thanks for the post: I might try this tomorrow! This is really good info guys but, I have trawled the net till my eyes bleed and I can't find anyone who will sell these "Dorman 49447" wiper bushes to Ireland. Does anyone know of a seller who can do this, please? 99 S Turbo. TD04-19T. 270/285. JGM. Question for those who used the Dorman 49447. Rather than trim the tabs and push it in that way, can't you fold the "ears" and push it thru the other way? Those 4 plastic ears that are coming off the top look like they're meant to be folded in during assembly and then pop back out to hold it in. I could be completely wrong since I haven't tried any of this yet, but I will be trying it soon. Wow, I forgot about this thread. This exact thing happened to my son's 01' OB last month. I was lucky enough to find the whole linkage assembly on ebay for 23 bucks shipped so I went for it. I just had to remove the motor and swap it on. After I did the swap I saw the Dorman kit in the auto store and wondered if that would work. BassMaker you ever find any? I could always pick up some and ship it over. Boil the bushings, no trimming required, takes about 30 seconds to install on the arm after maybe a minute in boiling water. 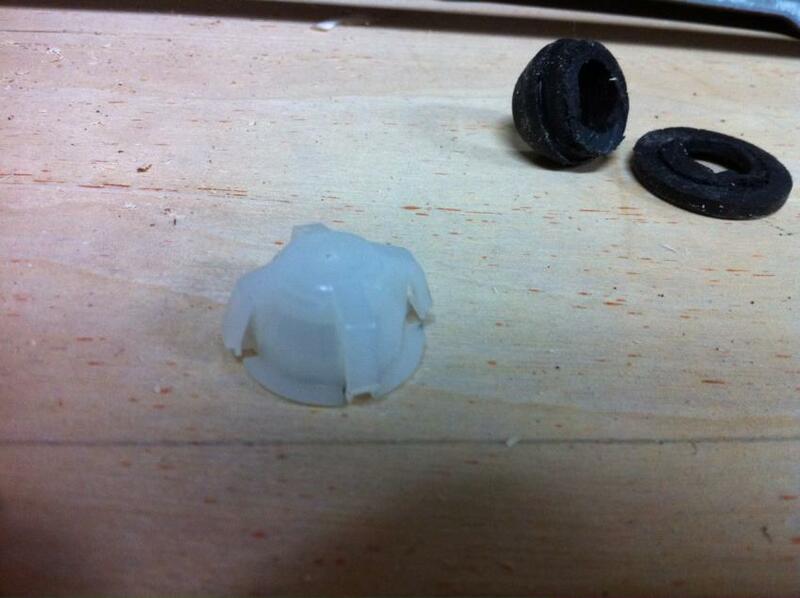 Boiling the old bushings also helps weaken them so you can pry the inner tabs inward and pop those off. Also make sure you keep track of the order of the arm arrangement, save yourself some real head scratching.